Armadillos are a growing nuisance along Florida’s Gulf Coast. Though they are not native to the area, the abundance of sod lawns, sandy soil, well-tended golf courses and concrete surfaces make the region a very attractive habitat for this armored and awkward beast. Nine banded armadillos are the most common species of this herbivore in Florida, and are seldom seen during the day unless they’ve been hit by a car. Adult nine banded armadillos weigh 7 to 13 pounds and have thick, bony armor covering all but their ears and bellies. Their damage is done mostly at night and in the early morning as they dig their long, deep burrows and forage for grubs. Because they love to burrow under hard surfaces, armadillos damage driveways, lanais, foundations and swimming pools. An armadillo often digs several burrows, increasing property damage as they get established. Armadillos feast on grubs, earthworms, yellow jackets, cockroaches and small invertebrates that are common pests in Florida. Unfortunately, they uproot ornamental plantings and dig holes in golf course fairways in their search for food, causing expensive landscape damage. Despite their odd appearance, armadillos are fast runners and great swimmers. Because they are not native to Florida, it is illegal to trap and release them elsewhere. Poisoning them is also illegal. Trapping an armadillo is not difficult, but must be carefully timed to its nocturnal habits. 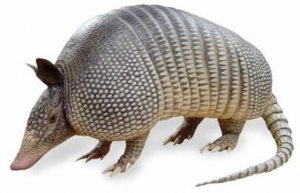 We urge residential and commercial property owners to call us at the first sign of armadillos for quick, safe and humane removal.